Back when I was at University, and attended a games club several times a week, I found myself in the situation where a bunch of us would order food from takeaway places as they were better than campus food (the campus food was ok, and did get better, but still…). We would choose a place, sort out our order, arrange all the money required to pay for the full amount and then call the order in. Or do it via web. We did it this way for a while as we frequently managed to get offers from the takeaway food places, and so we decided to invest any change as a result of special orders into the club’s funds – thus we raised funds by eating. This appealed to us. One of my favourite orders, and one of the main reasons my sporran doesn’t currently fit me, was fried crunchy chicken. basically, chicken, pan fried in a tasty crispy coating. Really bad for you, but I was not measuring its merits on healthiness but on deliciousness. Since leaving university, I have not been able to find any such chicken in my locale. Which is probably a good thing for my health. However, it would be nice to have it for a change. So, if the chicken won’t come to me then I must go to the chicken. I was inspired to do this when I saw the following video as a youtube suggestion. 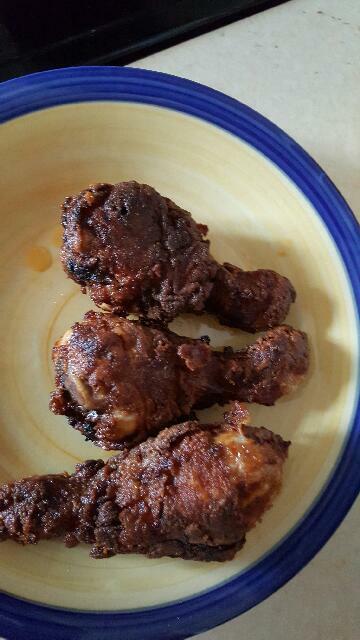 After watching the video, and following its instructions I made my first attempt at fried crunchy chicken. It wasn’t a disaster. But it didn’t look much like Chef Ramsay’s chicken. And, it tasted of flour. Two attempts later, I mastered it. First – you need chicken. I prefer legs. If they are frozen, make sure they are defrosted. If they are frozen, you will need to take them out of the freezer 2 days before they are for eating. Once defrosted (1 day before eating), you want to add some flavour, as well as a binding agent. (I think it is called marinading. For God’s sakes Jim, I’m a gamer, not a cook). Gordon Ramsay used Buttermilk. I used Homepride cooking sauce, tomato and bacon flavour. Half a jar will do. Pour it over the chicken, and then roll the chicken in it. Make sure your hands are clean! Add a bit of salt and pepper to the mix, and then put cling film over the bowl and leave in the fridge overnight. When it is time to eat, or more appropriately about forty minutes before, you get a dinner plate and put a small layer of flour along the base. This is trial and error. Too much and your crunchy coating tastes of flour (I learned the hard way). I then add in Paprika, Cayen Pepper, Garlic Salt, Salt and regular Pepper. Mix it up as best you can with clean hands. At this time, have a pan with about a centimetre or two of oil heating up. Careful it is doesn’t get too hot! Take your chicken from the fridge and roll it in the flour until it has a coating. The sauce or buttermilk will help make the floury mix stick. Try and keep the coating even. Once the chicken is coated, and the oil is hot enough (the surface shouldn’t be bubbling but you might see it starting to go in that direction), very carefully place the chicken in the oil. If the oil is hot enough, the flour coat will immediately become crunchy coating wherever it hits oil. The oil will react vigorously. Be careful you don’t burn yourself. You want to be cooking the chicken for a minimum of 25 minutes, 30 works too. I turned the chicken using tongs every 5 minutes. If it looks like the oil is going to start spitting, turn down the heat a bit. Not too much, as you don’t want uncooked chicken. This was trial and error for me. Fried Chicken with a mildly hot crunchy batter. How the heck am I supposed to hold it, exactly? Dieting started a the next day. See – it is more than just gaming! Decided to check out your blog. You are most welcome here. I am glad you like! Your blog is really something cool. Will definitely be back to visit. Thank you Vinnieh, I appreciate you stopping by and having a look around! My pleasure, hope you like my blog.